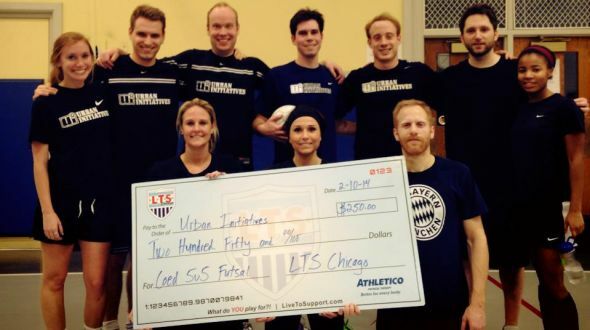 The following blog post was written by Junior board member Birger Buesching on behalf of all the dedicated Urban initiatives supporters that share their talents on the soccer field in lTS chicago sports leagues. So many dedicated staff, Junior board members and friends of urban initiatives have one thing in common … the love for soccer And their commitment for ui’s kidS in thE work to plaY progrAm. following the example of our kids on the soccer field, we put our firsT SoCcer team together in early 2012 to compete in chicago’s own LTS cHarity soccer league. LTS (Live to Support) Chicago’s vision is to generate awareness and contributions through the use of sporting and social events for Chicago charities (www.livetosupport.com). People can participate in active sporting and social events which, in turn, help Chicago’s charities through donations and awareness. You can play for the cause YOU and YOUR team support. What a better way to support Urban Initiative’s mission of youth-based health & soccer education programming than actually tying your cleats and hitting the soccer turf to compete for some recognition & money for the charity of OUR choice? Playing in a casual and friendly (but not less-competitive) environment immediately attracted many players to join our team. What started as a single team playing with the Urban Initiatives banner on the jersey grew into a little success story over time. In order to accommodate all the players interested in joining our fun cause, we quickly started a second team. And it didn’t take long that the first checks were coming in after winning hard fought battles on the soccer field. But even after losing close playoff-games (which unfortunately happened to us a few times), you never leave the field overly disappointed. Chicago has a lot of dedicated sportsmen playing for great charities, and sometimes it has to be their turn. A great benefit for Urban Initiatives has been the great PR we received through the league. New players learned about our cause in the pre-game “moments of awareness”, where the charity of your choice is being presented. – What do you play for? It took only a few weeks that other people picked up on Urban Initiatives. Seeing other teams start playing for us and making it their cause of choice is probably the most gratifying aspect that we drew from this experience. We truly appreciate this support and commitment. A big Thank You to all the great sportsmen out there! We like to thank LTS Chicago and its co-founder Mark Biery for all the support we received over the past years. At the end of every day, after the final whistle is blown, it’s the work and dedication of his team that makes this league happen and that is so priceless for the community and so many of Chicago’s charities. Personally, playing for Team Urban Initiatives is exciting and a lot of fun. The game days are becoming an inherent part of the weekly schedule and sometimes you can’t avoid thinking ahead in anticipation of the next game (especially comes playoff time). But what probably stands out the most, is how Urban Initiatives constantly attracts great people on and off the soccer field. It is fun playing with outstanding individuals who share the passion for soccer and care for Urban Initiatives. I got introduced to so many great new people and their friends, class mates and colleagues that I would probably not have met otherwise. And with all our various backgrounds we have one thing in common: the ideal of making a difference. Coming together in the spirit of great sportsmanship, staying active and enjoying each other’s company goes a long way. And at the end of the day are our aspirations not any different than the ones the kids at Urban Initiatives have. We know what we play for. – What do you play for?